Allegra Boverman/Gloucester Daily Times. At top, the Fiesta sign was painted and designed by Marty Behsman of Mar-T-Mar's Loco Logo's. 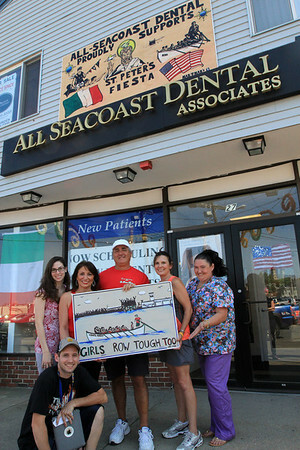 It is on display on the facade of All Seacoast Dental Associates on Commercial Street in Gloucester. The artwork depicts Fiesta in many ways. According to Behsman, St. Peter is in the middle, right above his outstretched fingers is James Tarantino who will be representing the USA against Canada in rowing. At far left is Stew McGillivray, the six-time Greasy Pole champ, being carried by his fellow walkers. At right are is the rowers of the Nina being scuttled by Carlo "Sleepy" Pallazola. Behsman is kneeling at lower left. Standing with another of his pieces depicting the women's siene races are, from left: Dr. Lindsey Jackson, coxswain Joanne Frontiero, scuttler Joe Balbo, Leeanne Pallazola, the senior women's siene boat champion for the last four years in a row, and Jaime Mejia-Pallazola.